The electro-harmonix Slammi polyphonic pitch shifter pedal gives you much more than a divebomb pedal. Sure, you can send your guitar tone plummeting down or soaring up three octaves, but that's just the start. Set the bend range to zero for a warm, watery chorus effect. 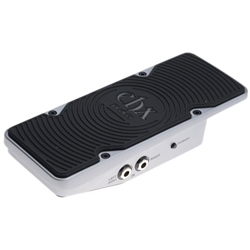 Rock this rugged pedal to bend your guitar's pitch up or down, or set the effect to the heel-down position for an "always on" effect. And no matter how fast you play, the Slammi pedal will track perfectly. You can use the EHX Slammi pedal just like the whammy bar on a guitar, without worrying about your guitar's tuning stability. But whammy-style effects aren't all you get here. You can blend your dry tone with the pitch-shifted tone, so you can create complex harmony effects too. Or use it to bend your whole tone to extremes like Tom Morello (Audioslave, Rage Against the Machine). You can also set the Slammi to produce a swirling chorus effect, giving you a wide range of sounds at your disposal.